We provide a meaningful, creative and fun day service for adults with a learning disability, autism or Aspergers each Tuesday at the Findhorn Ecovillage, Moray, Scotland. Through the creation of a healthy daily structure at our community garden project, we build participants’ confidence and help to develop their social and practical skills (while having lots of fun along the way). We also offer a variety of creative sessions each afternoon to support the expansion of participants’ experiences in addition to their integration into the Findhorn Ecovillage Community. To find out more about our service see below or click here. Alternatively, you can contact us directly (telephone 01309 690700 or email: carefarm@findhorn.org) to find out more and see if our service is suitable for the person you support. We are able to offer services to those with a Self-Directed Support budget. Our day service at Findhorn Bay Care Farm runs each Tuesday, 46 weeks of the year. We welcome adults with a learning disability, autism or Aspergers to join us at the Findhorn Ecovillage to share their many gifts with those around them and to help build our community. To see some more images of what we get up to, why not visit our Facebook page. 09:00 / 09:20 Bus pick-up. There is a mini-bus pick-up from a location in Elgin and Forres at 09:00 and 09:20 respectively. This bus takes participants direct to the Findhorn Ecovillage. 09:30 Start in the garden. We start at our community garden project each Tuesday morning undertaking a variety of tasks that need to be completed. These vary throughout the year and include: seeding, planting, harvesting, weeding, composting and many others. We have a dedicated and new polytunnel to keep us warm and dry if the weather turns on us! 12:30 Break for lunch. After a short walk, we enjoy a two-course buffet lunch at the Findhorn Ecovillage Community Centre. This lunch is included in the service fee. 13:30 Afternoon session. We enjoy a variety of different afternoon sessions. These vary depending on the time of year and include: pottery in the earth-lodge (traditional open-top dwelling with fire), forestry conservation, group discovery games, land art (using the landscape as our pallet and canvas), creative dance, baking, outdoor bread-making amongst others. 15:30 day ends. The bus takes participants back to the pick-up/drop-off location in Forres (by 15:40) and Elgin (by 16:00). For service pricing, please click here. 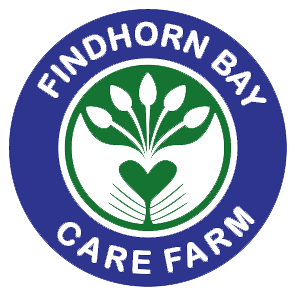 Findhorn Bay Care Farm is a project run and managed by the Findhorn Foundation (Scottish charity number SC007233).